"Terracotta Warriors Exhibition Includes Projected AR"
This week sees the launch of China’s First Emperor and The Terracotta Warriors – a spectacular new exhibition that features projected AR and other immersive installations from Draw & Code. Our creative technologists are aiming to bring the Terracotta Warriors to life using a suite of the latest immersive technology including a projected augmented reality set-up that overlays digital animation on and around the artifacts. The archaeological wonders will be the key attraction at Liverpool’s World Museum as part of the blockbuster ‘China’s First Emperor and the Terracotta Warriors’ exhibition, for which the organisers have commissioned an extensive visual and audio element to make the exhibition truly spectacular. With over 140,000 tickets sold before the exhibition had opened, this looks set to be one of the UK’s cultural highlights during 2018 – and it is the immersive technology, set building and overall attention to detail that will differentiate this from other Terracotta Warriors exhibitions. The Terracotta Warriors’ Liverpool visit is being enhanced by a narrative-driven projected AR experience that also boasts immersive audio soundtracks and even olfactory installations. 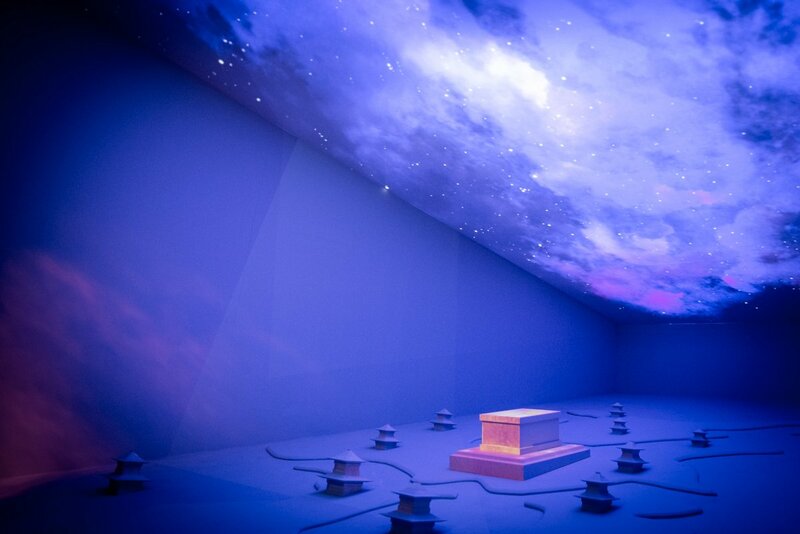 Visitors will be vividly transported through centuries of Chinese history to see, hear, smell and feel the world the Warriors inhabited. Draw & Code have closely collaborated with audio-visual experts Adlib who have helped to push the limits of this technology. False walls conceal projectors, the spaces that are available to project within push the boundaries of just how compact a major projection mapping set-up can be and their bespoke audio installations evoke the drama of the age depicted by the exhibition. As ever, the Adlib team have gone above and beyond to make the creative vision a technical reality – their dedication and expertise has made the impossible possible. Opening on the 9th February until the 28th October 2018, China’s First Emperor and the Terracotta Warriors features more than 180 artifacts from museums across Shaanxi Province in North West China. Visitors will come face to face with extraordinary Terracotta Warriors, including a life-size terracotta horse, as well as other exquisite objects from the Emperor Qin Shi Huang’s vast burial site, and the ambitious exhibition will embrace new techniques to help convey the world of the Warriors. Fiona Philpott, Director of Exhibitions at National Museums Liverpool, said: “Draw & Code are helping the team at National Museums Liverpool to create a unique interpretation of the Terracotta Warriors. Their mastery of emerging technologies and digital techniques has elevated the content to a new level. “We believe that visitors will be amazed by the spectacular artefacts as well as the astonishing presentations which will help to transport visitors back in time to a most fascinating ancient world. Draw & Code’s expertise in immersive storytelling and events is being utilised to bring the history of China and the spectacular Terracotta Warriors to life. Andy Cooper, Draw & Code’s Creative Director, said: “The team at National Museums Liverpool is looking to do much more than place artefacts in a room – their intention is to create an atmosphere that transports you to the time of the Warriors and to inject narrative structure into the experience, so our use of emerging technology such as projected AR has been selected to allow the static display to tell its own story. Not only has XR technology been utilised within the exhibition, during the development of the project, Draw & Code collaborated with National Museum Liverpool’s in-house designers to simulate the set-up for the exhibition in virtual reality. John Keefe, Creative Technologist and Draw & Code co-founder, said: “The Terracotta Warriors haven’t been to a museum in the UK outside London for more than 30 years, so the commissioning team wanted to use every tool at their disposal to ensure visitors have the best possible experience when they come to Liverpool. Tickets for ‘China’s First Emperor and the Terracotta Warriors’ are on sale now at www.liverpoolmuseums.org.uk/terracottawarriors with the exhibition itself opening on 9th February 2018.